"John Coltrane, A Love Supreme - OBI Box Set - 10 CDs"
JOHN COLTRANE - A LOVE SUPREME OBI BOX AND THESE TITLES - BALLADS - A LOVE SUPREME - AND JOHNNY HARTMAN - DUKE ELLINGTON AND JOHN COLTRANE - LIVE AT THE VILLAGE VANGUARD - COLTRANE - CRESCENT - AFRICA BRASS - KULU SE MAMA AND LIVE AT VILLAGE VANGUARD AGAIN - First-pressing-only 10 CD box set Japanese OBI MINI REPLICA BOX SET Japanese re-mastered Mini LP replica Limited Edition Collection Recorded from the finest Original Masters available. Each title Comes with anti-static sleeves similar to Vinyl LPs, Cardboard packaging exact to the original LP, Re-sealable plastic wrap cases for protection of each collectible Actual miniaturized version of the 12" LP in 4" CD version Special VERY RARE LIMITED EDITION BOX SET ONLY PRODUCED ON FUTURES FOR THIS ONE TIME PRESSING -- were only available in Japan. 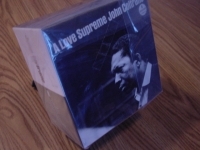 JOHN COLTRANE - A LOVE SUPREME OBI BOX AND THESE TITLES - BALLADS - 1. Say It (Over and Over Again) 2. You Don't Know What Love Is 3. Too Young to Go Steady 4. All or Nothing at All 5. I Wish I Knew 6. What's New? 7. It's Easy to Remember 8. Nancy (With the Laughing Face) A LOVE SUPREME - 1. Love Supreme, Pt. 1: Acknowledgement 2. Love Supreme, Pt. 2: Resolution 3. Love Supreme, Pt. 3: Pursuance/Pt. 4: Psalm AND JOHNNY HARTMAN - Part of the Impulse Best 50! Series. Japanese exclusive 24-bit 96khz digitally remastered reissue of 1962 album 1. They Say It's Wonderful 2. Dedicated to You 3. My One and Only Love 4. Lush Life 5. You Are Too Beautiful 6. Autumn Serenade DUKE ELLINGTON AND JOHN COLTRANE - Perhaps looking to renew his inspiration or maybe simply wanting to broaden his horizons, Duke Ellington began a string of collaborations in the second half of his career--whereas before that, his own band was stimulus enough. Whatever the reason, almost all of his collaborations succeeded at high levels, although none of his shared sessions are more intriguing on the surface than this 1962 date with the preeminent sax star of the day. In reality, the record amounts to "Coltrane Plays Ellington" (plus one Coltrane original) because the tenor man is the whole show--and what a show it is. Only Coltrane could be as "fiercely tender," and there's no better forum for his sensitive side than the music of Ellington and Billy Strayhorn, who contributes the album's true vertex, "My Little Brown Book." The rhythm section alternates between Duke's and Trane's, each adding a different texture to the proceedings. Ellington is wise enough to appreciate the nature of the session, and he is quite content to feed chords in service of the young master--proving the old master's open mind and good taste. Hearing Coltrane seize "In a Sentimental Mood" is thanks enough. 1. In a Sentimental Mood 2. Take the Coltrane 3. Big Nick 4. Stevie 5. My Little Brown Book 6. Angelica 7. Feeling of Jazz LIVE AT THE VILLAGE VANGUARD - 1. Spiritual 2. Softly, As in a Morning Sunrise 3. Chasin' the Trane COLTRANE - Part of the Impulse Best 50! Series. Japanese exclusive 24-bit 96khz digitally remastered reissue of 1962 album. 1. Out of This World 2. Soul Eyes 3. Inch Worm 4. Tunji 5. Miles' Mode CRESCENT - 1. Crescent - John Coltrane, John Coltrane 2. Wise One 3. Bessie's Blues 4. Lonnie's Lament 5. Drum Thing AFRICA BRASS - Part of the Impulse Best 50! Series. Japanese exclusive 24-bit 96khz digitally remastered reissue of 1961 album that's out-of-print domestically 1. Africa 2. Greensleeves 3. Blues Minor KULU SE MAMA - Part of the Impulse Best 50! Series. Japanese exclusive 24-bit 96khz digitally remastered reissue of 1965 album 1. Kulu Se Mama (Juno Se Mama) 2. Vigil 3. Welcome AND LIVE AT VILLAGE VANGUARD AGAIN - Part of the Impulse Best 50! Series. Japanese exclusive 24-bit 96khz digitally remastered reissue of 1966 album. 1. Naima 2. Introduction to My Favorite Things 3. My Favorite Things First-pressing-only 10 CD box set These are Japanese digitally re-mastered Mini LP replica CDs (the OBI Edition). This Limited Edition Collection has only VERY FEW made world-wide and are immediately Out of Print. Recorded from the finest Original Masters available. Comes with anti-static sleeves similar to Vinyl LPs, Cardboard packaging like an LP. Actual miniaturized version of the 12inch LP in 4inch CD version.